The first card represents your hope for this relationship, and the 9 of Clouds tells me that you hope to be done shedding tears over your broken heart, you are tired of suffering in love. You feel your love and attention were “wasted” (though love is never really wasted!) in situations where it was not reciprocated. But this feels different, and so, you dare to hope to be done suffering in love for good! The greatest strength of this relationship is that it feels so full of possibilities and potential. You are both trying to jump in with both feet first, regardless of how burned you’ve been in the past. Seems you both have kind of an “it’s now or never” attitude about this, and are willing to put in the work towards making the relationship last. (V: No-Thingness). 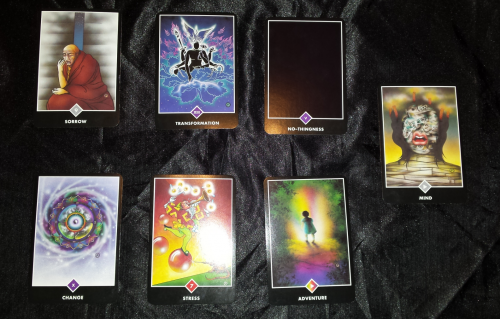 The final card shows us the likely final outcome if things stay on the current track. I don’t believe in predestination, so if this final card isn’t too positive, I look at it as a warning, not an inevitability. In this case, it looks like both you and her are carrying so much emotional baggage, you may get caught up in your own heads in negative assumptions about one’s feelings towards the other. This can lead to a breakdown in communication, where she thinks you’re feeling one way, and you think she’s feeling another, and so you create a mountain out of a molehill, escalating tiny issues into big blowups. The key to avoid this is to maintain open lines of communication. Speak compassionately to each other, remember that a kind word goes a long way. Always assume that the other person isn’t hurting you intentionally, rather they might be inadvertently pushing buttons that were put there by previous heartbreak. If she says or does something that hurt you, take a step back and a deep breath, and assume it was probably unintentional. Kindly let her know how she made you feel. You may be surprised at her reaction. There is definitely a lot of potential for healing for both of you in this relationship. I know it’s hard to let go of the past and “love like you’ve never been hurt before”, but that is precisely what is needed in order for true love to blossom. Allow yourself to be vulnerable with her, and she will do the same with you, and from this, intimacy and love will grow. Talk to each other, and err on the side of openness. There are three major arcana (more powerful cards!) in this spread: Transformation, No-Thingness, and Change. It seems like there will be some conflict between you because of a fear of change in your part, note the play in between your biggest fear (Change), and her biggest hope (Transformation). Remember that we can only grow by allowing ourselves to change, and MAKING ourselves change for the better. It’s not easy, but it sure is rewarding! The other major arcana shows up on the relationship’s strength position, while the relationship’s weakness position is taken by a minor arcana card. This tells me that, overall, this relationship is stronger than it is weak. Just like anything else worth doing, it will require work, so watch out for those potential pitfalls. This entry was posted in Readings and tagged in 7 cards, Barbara Moore, love, Paul, reading interpretation, relationship, sample, Shadowscapes, tarot.